Cloud computing has become synonymous with the digital agenda. Looking across the 2018 IT estate, cloud is no longer conspicuous by its presence but by its absence. Gartner projects the market size and growth of the cloud service industry at nearly three times the growth of the overall IT services industry through 2022. Cloud is agnostic of industry sector, having already established a material foothold in banks, schools, governments and healthcare. 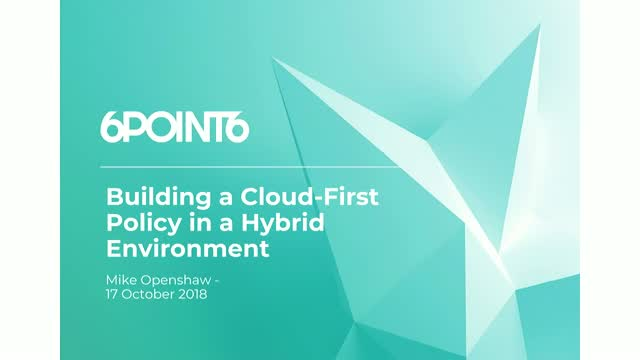 In this webinar, we will explore what a cloud-first policy means for you no matter where you are on your cloud journey, with a focus on both where your remaining on-premise IT estate sits and how this fits into a cloud-first world. Mike is a TOGAF and SAFe certified architect specialising in the strategic enterprise and solutions architecture space, with a solid background in integration, application, infrastructure and data architecture. He has a proven track record of delivering strategic business goals through business transformation programmes (up to £30M+) with complex interdependencies across the enterprise. Mike has extensive sector experience having worked in financial services, retail banking, digital eCommerce, not for profit, utilities and FMCG organisations. He has a comprehensive background of technology leadership and transformation, business process re-engineering and systems integration over a wide range of heterogeneous technology environments, from hybrid cloud solutions to physical on-premise estates.